I thought I'd give a bit of a recap of our holiday break for those that haven't been able to follow along with our twitter (https://twitter.com/DaveMacD0nald) https://twitter.com/SheenaSheena00) or Facebook posts. We typically use all three mediums, although the blog seems to be third fiddle sometimes! It is nice to sit down and type though. First, the above photo. The dog in the foreground is Willow's new neighbour, 'Jake' as the kids have named him. He visits the now middle aged Willow daily, or Willow makes the trek down to his house for a game of chase and usually ending up with Jake teasing with some food or a toy of Willow's. 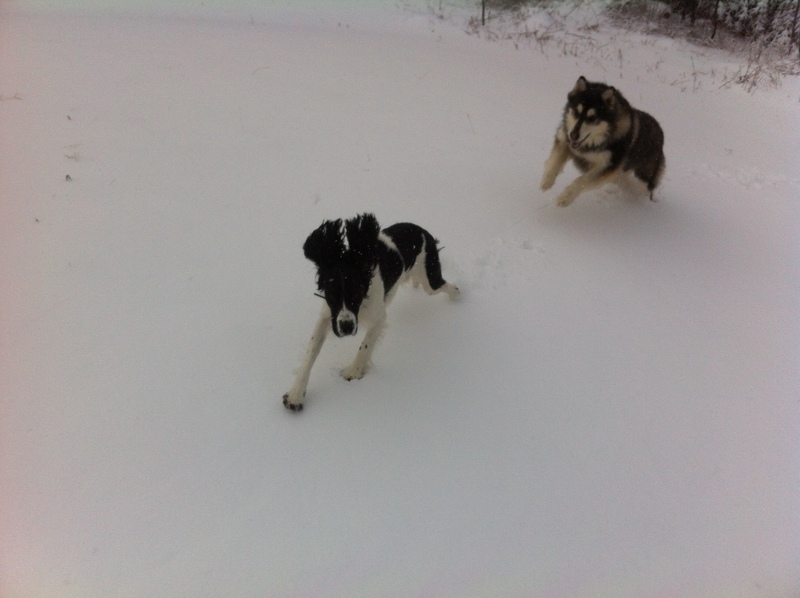 They seem to be good buddies and Jake being a springer spaniel is fast. 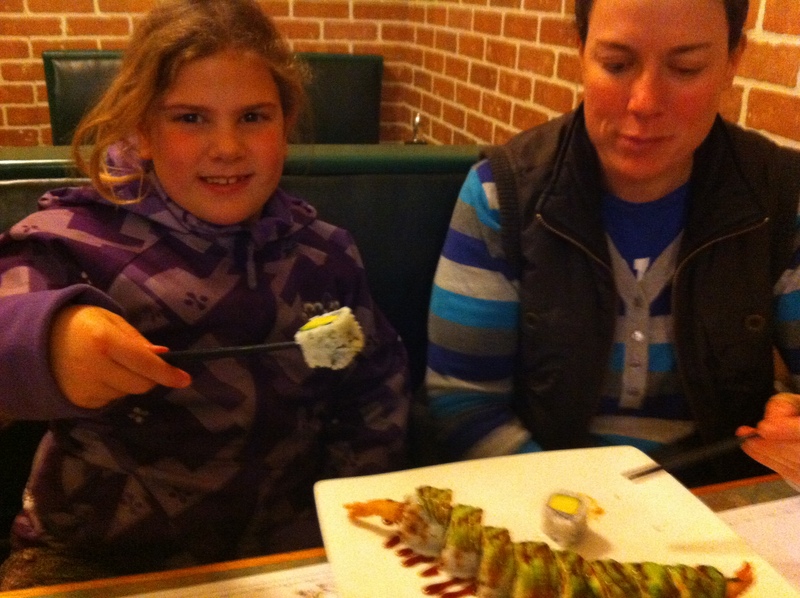 At the beginning of school break, we took the kids to our new favorite spot to eat in Sussex, Sushi Jo's. We enjoyed a nice urban meal in a small town. Rebecca and I over did it with the Udon soup, a story told by her ever since. 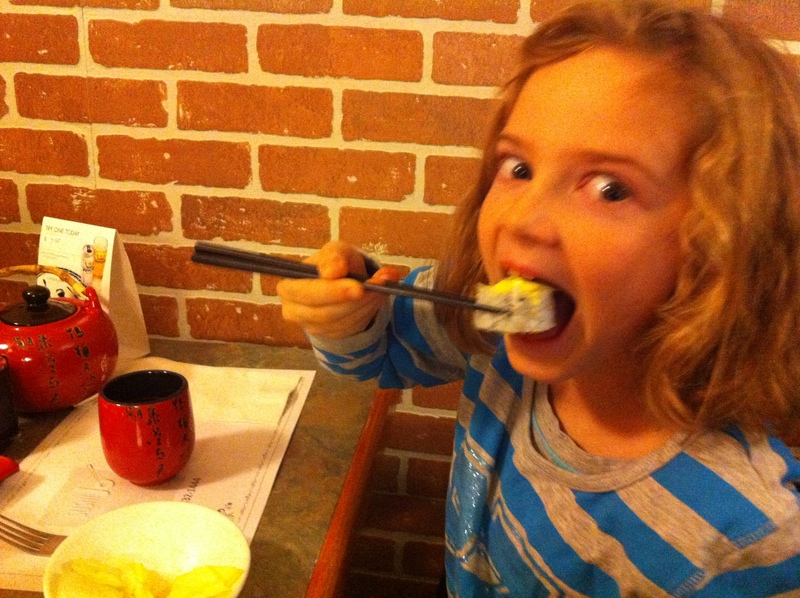 Abby was a trooper with the sushi rolls and was able to use her chopsticks! We planned a trip to Moncton for a visit with Sheena's parents and G-Nan, which was fun to catch up prior to Christmas. While on the way, we decided to head down to Cape Breton for a surprise visit to my parent's house. Laurena was also down for the days before Christmas. We arrived for a 3 day visit with only a day and a bit of clothes, but nevertheless surprised everyone when we showed up on a Sunday afternoon. The kids pretended to have taken the bus down to Cape Breton while their parents were nowhere in sight. We were able to have another surprise when Laurena and Mom came home as well. Good fun. 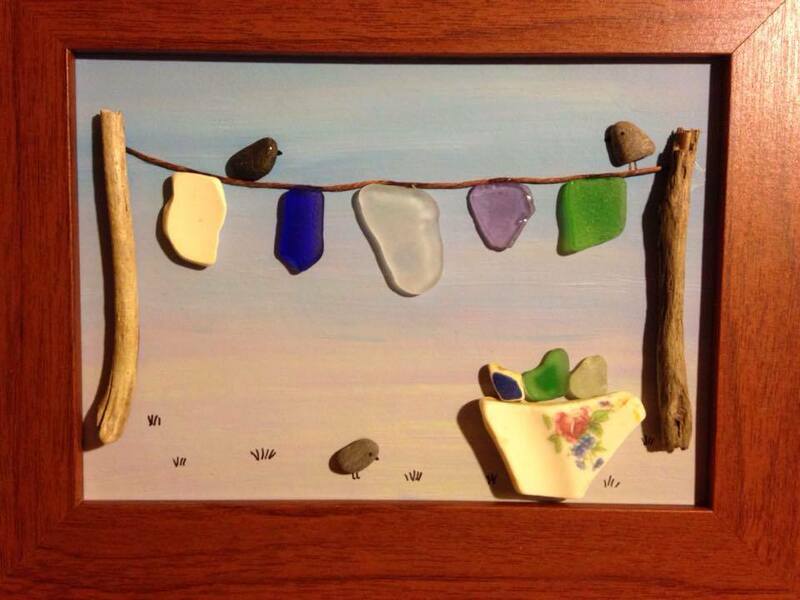 Of course, no trip to Cape Breton can be complete without a trip to the beach. This day was very cold and with high winds, there were spectacular waves. 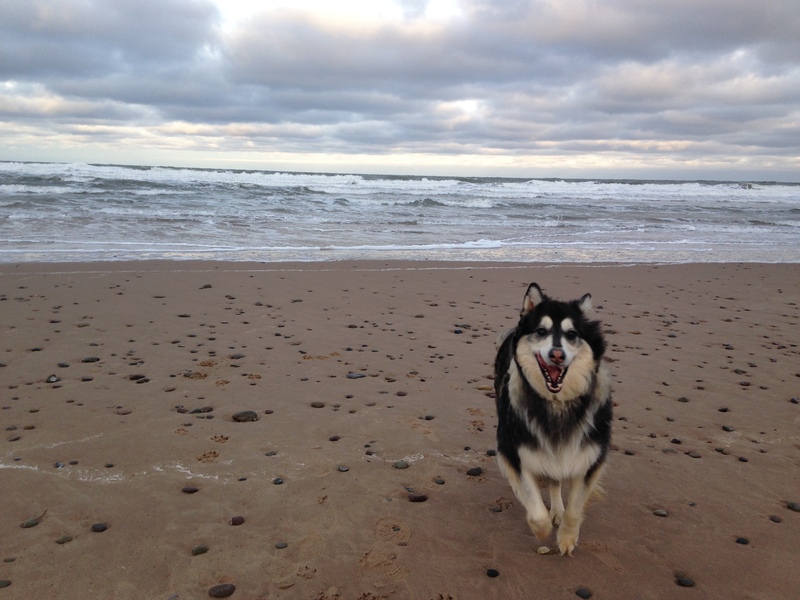 It was difficult to seaglass hunt with the cold weather and Sheena actually abandoned her efforts! 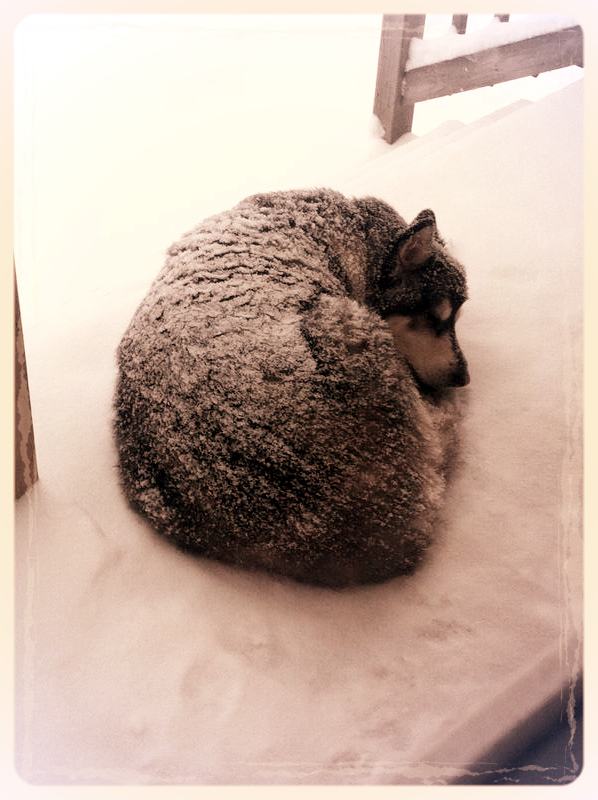 Willow seems to be oblivious to the cold. 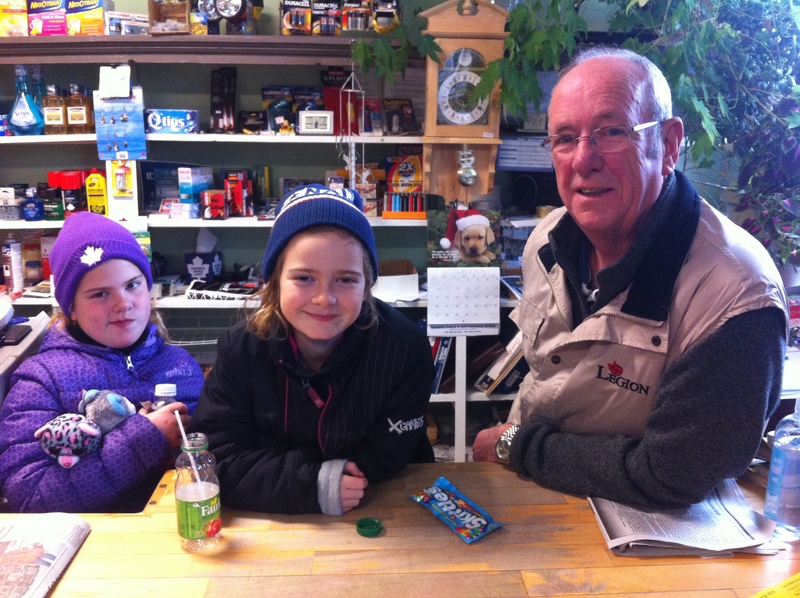 The girls were able to visit Grampa in the store a fair bit while we were down for the short time. Rebecca took her turn at serving the customers. One customer came in and was having a friendly chat with Rebecca behind the counter. He asked if she was being paid by Grandpa and Rebecca repied, 'no, but paid in juice!' We all laughed and the nice man gave Rebecca a tip for bagging the groceries. Upon our return home, we settled in for Christmas. 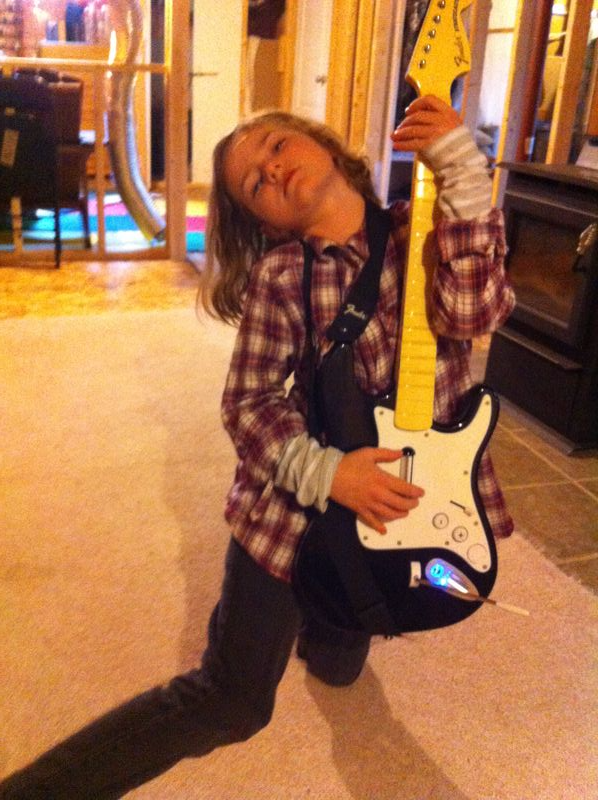 One of the latest fun we've been having with the girls is playing the 'Rockband' game on Nintendo. The girls have taken to it well and seem to be learning a bit about timing and beats. They can show their Dad how to keep time with the music for sure. 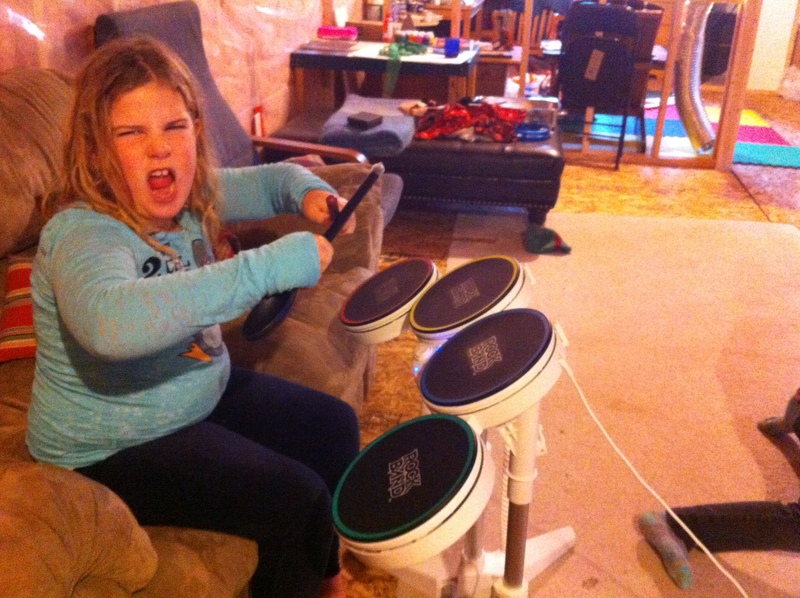 Abby loves the drums and Rebecca is keen with the guitar. Even though the girls have been absolutely obsessed with Star Wars lately, you may wonder if the below picture is of a Stormtrooper boot or something of the sort. 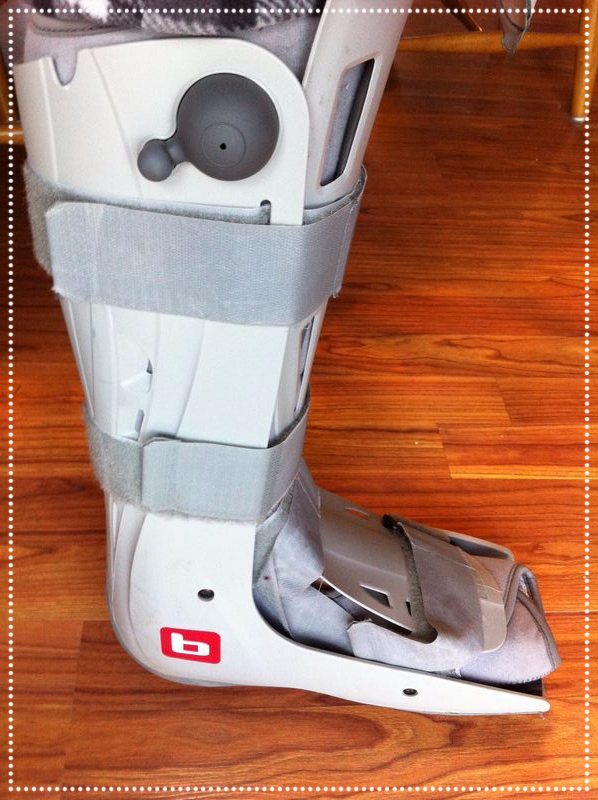 Well, its not, but what it is is a bit of freedom for someone afflicted with a broken leg! After a month in a hard cast, this was great to use and be able to walk around without crutches and participate in a few more activities. We've had a few snow storms, but nothing like the ones we had in years past. Generally though, Willow is content to stay outside most of the day and despite being covered with snow when she's out there. We've also been watching a neat outdoor survival show which you've all heard about, but the kids are finally able to enjoy, namely, Survivorman. 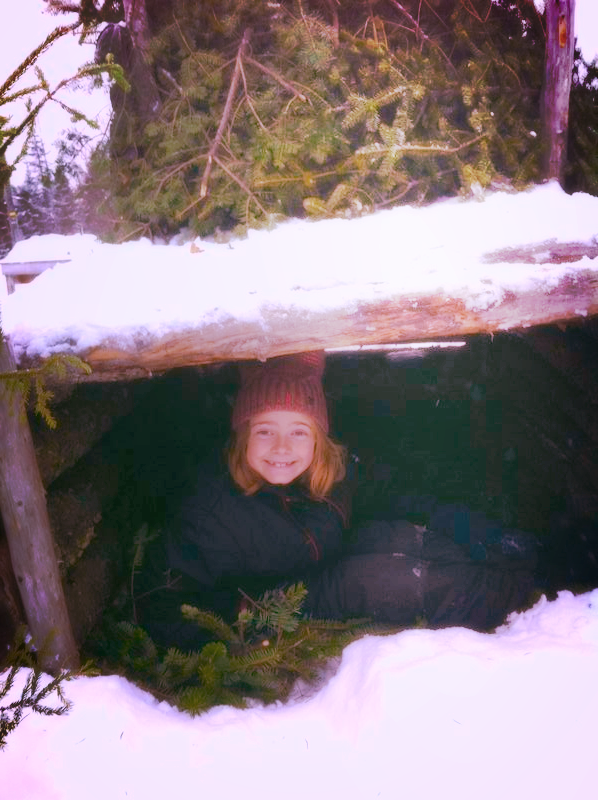 The girls have been getting into the show and tried making their own shelters in the woods after watching Les Stroud do a few on TV. 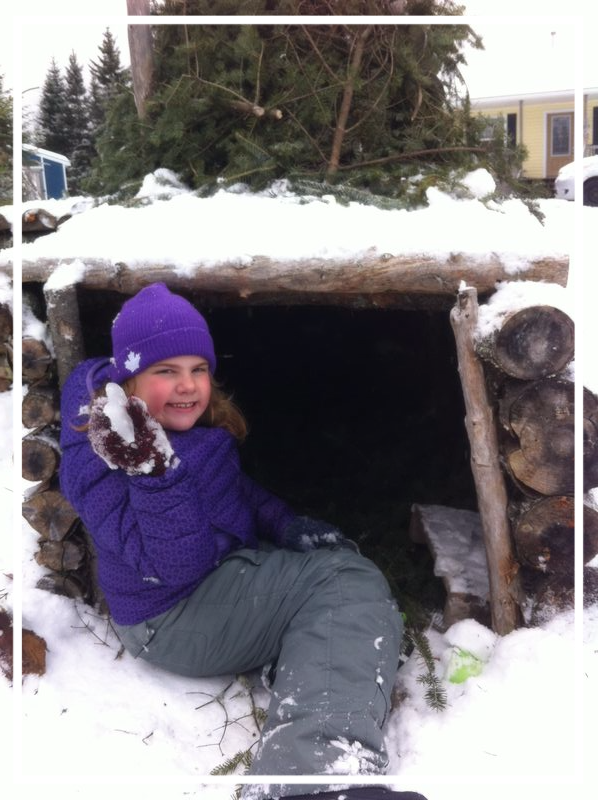 Today, we headed out and made a nice shelter with left over tree bows from Christmas and outfitted their play fort with some warm floor bows and a roof. 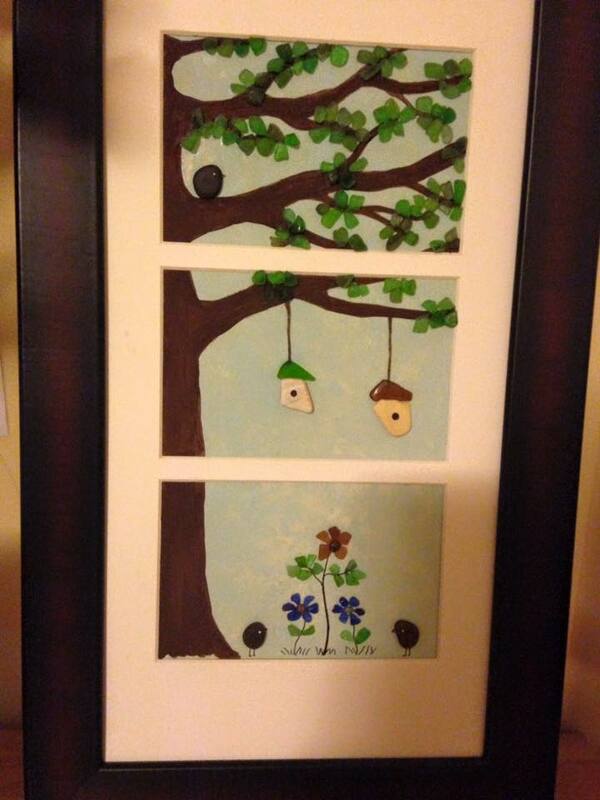 Both were excited to make something of their own similar to what they had seen on the show. 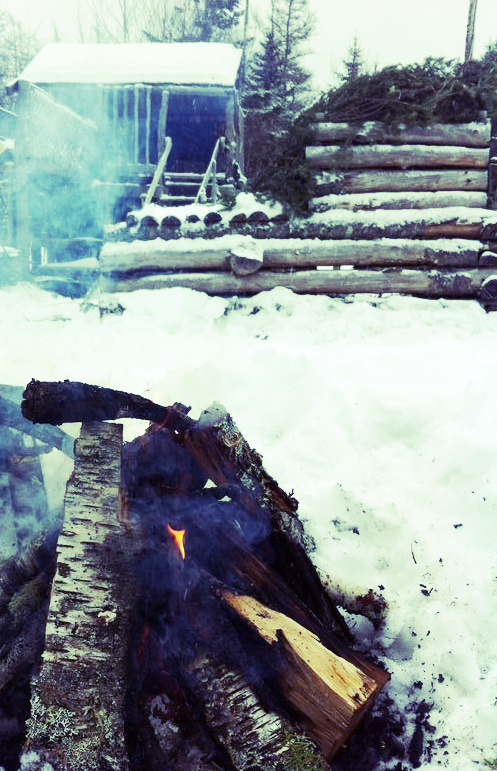 We haven't yet elevated to the 'sleep outside' in the home made shelter, but I'm sure I'll be able to convince them to at least try it out one 'warmer' evening.